Prohibition Agents James Harney, C. W. Williams, Robert Carr and A. L. Camlin went to the Harry Hedstrom farm near Tamarack, MN, to search for a still. The agents separated and began a search of the heavily wooded property. After a two hour unproductive search, all agents except for Agent Harney returned to the government car. The agents searched an additional two hours trying to locate Agent Harney and during this second search, found the still. Fearing for Agent Harney's safety, additional agents were brought to the scene. The search continued all night, and they built fires and set off flares, to no avail. 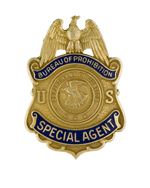 The following day, almost every Prohibition Agent in the State had been called in to assist with the search. Late the following morning, Agent Harney's body was found buried under a fallen tree, covered with moss, fallen leaves and dirt. The coroner later determined that he had been shot twice with a .22 caliber rifle. Agents quickly identified brothers Harry and Gustaf Hedstrom and Emil Givings as operators of the still. They arrested Gustaf Hedstrom and Givings. Mr. Givings acknowledged part ownership of the still, but denied knowledge of the murder. Hedstrom admitted telling his brother, Harry, that "the Feds" were searching the woods around his house and also acknowledged that shortly thereafter, Harry went into the woods carrying his .22 caliber rifle. 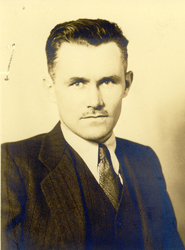 On September 25, 1932, agents located and arrested Harry Hedstrom who confessed to the murder. He stated that Agent Harney had surprised him as he attempted to hide the still. He tried to run away, but Agent Harney was in pursuit and he realized it was futile. He shot Agent Harney, who fell to the ground wounded. Hedstrom then shot him again and buried his body. On September 29, 1932, just six days after Agent Harney's murder, Hedstrom was indicted for murder, convicted and sentenced to life imprisonment. These actions all took place on the same afternoon. Agent Harney joined the Prohibition Unit on March 20, 1924, with an annual salary of $1,500. He carried badge #158. Agent Harney's brother, M. L. Harney, was the Prohibition Chief for the Chicago Field Division. Agent Harney was born in Cloquet, MN. He was survived by his wife.